The Wand Company’s Pip-Boy construction kit is a beautifully designed, highly detailed and fully accurate replica of the Fallout 76 Pip-Boy 2000 Mk VI. Presented in an authentically vintage display case, the kit has been designed to mimic the look and feel of the kits that Vault-Tec™ may have supplied to vault dwellers to help them understand the value and mechanical workings of the all-important Pip-Boy technology. Keep and display the kit in its presentation case, or assemble over 100 components to create this highly accurate collectible. Using the Vault-Tec tools provided, and following the fully illustrated instructions, you will see how easy it is to combine fabric, moulded and cast parts, metal bolts, grilles, screws and cables to create one of the most important pieces of Vault-Tec equipment. Take care and learn well; your survival just might depend upon it. Authoritative: The only officially-licensed Pip-Boy 2000 replica. Authentic: Vault-Tec through-and-through; nothing comes closer to the real thing. Original tools: Vault-Tec has supplied everything you need to build this masterpiece: no paint or glue needed. Working mechanisms: Spring-loaded buttons and a holotape ejection mechanism. Over 100 parts: Huge level of intricate detail for an authentic look once assembled. Easy to build: No specialist skills are necessary for this project. The easy-to-follow, step-by-step instructions take you through the rewarding process of creating this legendary piece of RobCo hardware in the comfort of your own home. Remember: Hard work is happy work! Attention to Detail: Laid out like an authentic vintage construction kit, this Pip-Boy takes replica ownership to a whole new level of immersion. Carefully designed to give the highest level of reward for effort spent, each part fits snugly where it should, resulting in a robust, well-made collectible that is suitable for cosplay or display. Quality Materials: Use the drop-forged mild steel spanner for tightening real bolts; an aluminium extrusion secures the woven strap; a softly padded fabric cuff provides a comfortable fit; put them together with die-stamped components and high-quality injection mouldings to create a truly authentic look and feel. 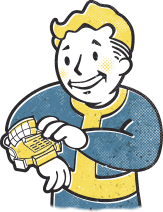 The Ultimate Collectible: Whether you’re just a casual player or a core fan who’s buried deep in Vault-Tec lore, how can you continue with Fallout 76 without owning a replica of the ultimate piece of Fallout tech? Over 150 highly detailed parts make certain this ultimate collectible will take pride of place in any collection. The Fantasy Made Real: You can’t get closer to the in-game Pip-Boy geometry than this. Designed using 3D geometry from Bethesda’s design studio, this kit captures each nuance of the in-game device. Buttons press, knobs turn, the radio dial ‘tunes’ and the holotape player ejects a holotape just like it does in the game. The Wand Company’s Pip-Boy construction kit is a beautifully designed, highly detailed fully accurate replica of the Fallout 76 Pip-Boy 2000 Mk VI, though it has no electronics functionality, the spring-loaded buttons on it are designed to press, the knobs turn, the radio dial works and the holotape player opens to eject the holotape. It is Fun to Build the Future, and what better way to start than putting together your own Pip-Boy 2000 Mk VI!! Easy to follow, step by step, illustrated instructions will guide you through the building process. The parts have been designed to go together satisfyingly well, to create a pleasing result. If you’re an expert scratch builder, then there’ll be plenty to mod. If this is your first build, then you’ve started in the right place.